Summer has been very disappointing this year. For me, for a summer to be a good, successful summer, certain demands need to be met. For instance, I want to spend at least one day passed out near a body of water, even in the shape of an inflatable pool. I also like to jump in a body of water drunk, stark naked and at night at least once in summer. Neither of those requirements of summer have been met this year. Other things that I’ve missed: a heat so intense even I tire of it, kilos and kilos of flat peaches, nightly bike rides back from some party in a godforsaken middle of nowhere, the reading of several books in one sitting in the backyard because you have nothing else to do anyway. A summer romance would have been nice, too. None of that, either. I’m not necessarily complaining – I’ve had fun over the past 3 months, I really have. But I just don’t really have the feeling it was summer fun. I was still sort of waiting for that very last heatwave that we’d been promised, but instead the winds got colder, the sky greyer, and my hopes thinner. There was nothing for it but to put my bunny jumper and some socks on, play some gloomy music and make peace with autumn. I got rid of the pumpkin’s cruel countenance with the hand blender, and made some pumpkin ginger soup. It made me feel better. Chop up the onion, garlic and ginger, gently fry in some oil. Peel the pumpkin if you want to, get rid of the seeds and dice it. Wash the potatoes and dice them, too. Then add both the pumpkin and the potatoes to the pots, cover the whole bunch with a wee bit of water (just a little, if your veg is halfway immersed that’s plenty), put the lid on and let simmer for ages. When it’s all soft (half an hour or so later, I’d say), grab your hand blender and purée the ingredients. 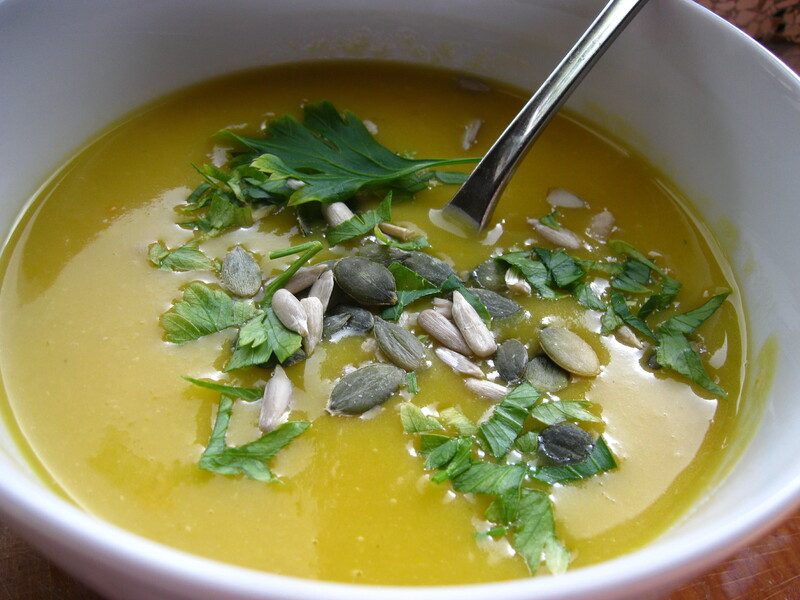 Then add veg stock until you like the consistency of the soup, add some coconut milk, taste for salt and pepper, and when you’re happy with it, serve it topped with some pumpkin seeds and parsley. 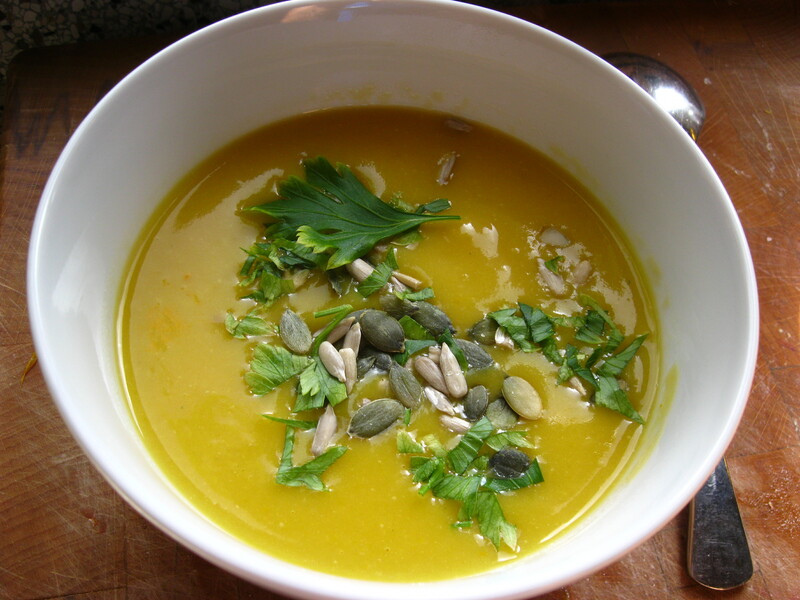 This entry was posted in Vegan, Vegetarian and tagged autumn, autumn recipes, cooking, fall, food, pumpkin, pumpkin soup, soup, vegan, vegetarian. Bookmark the permalink.